The labor movement, the left, and the city of Chicago lost an icon Sunday with the passing of legendary steelworker Ed Sadlowski at the age of 79. “When you think of Chicago and labor, you think of someone like Eddie,” Studs Terkel once remarked. Sadlowski was best known for his insurgent run for the presidency of the United Steelworkers (USW) in 1977, when he was 38 years old. Though largely forgotten today, Sadlowski’s “Steelworkers Fight Back” campaign captivated the nation, with Terkel saying it was more important than that year’s presidential election between Gerald Ford and Jimmy Carter. During the 1970s, a young, more diverse generation of workers, infused with a spirit of militancy not seen since the 1930s, challenged the leadership of out-of-touch union officials who tended to be more comfortable with the bosses than with the rank and file—a movement for union democracy that eventually led to the founding of the publication and organizing project Labor Notes. Sadlowski’s campaign was widely seen as a battle for the soul of the labor movement, pitting militant social justice unionism against complacent business unionism. In 1973, the entrenched leaders of the USW, who called themselves “the official family,” entered into an Experimental Negotiating Agreement (ENA) with the major steel companies, agreeing not to strike even after contracts had expired. The Steelworkers’ 1.4 million members were not consulted. While high-ranking union officials like USW President I.W. Abel thought surrendering the right to strike was the future of labor-management relations, Sadlowski believed it was time for a return to old-fashioned worker militancy. His heroes were Eugene Debs, Joe Hill, Mother Jones, John L. Lewis and Paul Robeson. His basement was a warehouse of labor history artifacts and memorabilia. In stark contrast to most labor leaders of the time, Sadlowski had opposed the Vietnam War and supported the civil rights movement. “There’s no way you can be a union man and a racist,” he insisted. Born into a steelworker family on Chicago’s Southeast Side in 1938—just one year after the Memorial Day Massacre—Sadlowski learned the values of working-class solidarity and the history of the labor movement from his father, who was active in the CIO organizing drive that built the USW. At age 18, Sadlowski got a job as an oiler in the machine shop of U.S. Steel South Works, earning the nickname “Oilcan Eddie.” At 25, in an upset victory over the incumbent leadership, he was elected president of USW Local 65 where he oversaw 23,000 workers. When the USW’s “official family” agreed to the ENA in 1973, Sadlowski declared it was “time to fight back” and ran for the directorship of USW District 31—the union’s largest district, representing nearly 300 locals across Chicago and Gary, Indiana. Soon after taking over District 31, Sadlowski launched his “Steelworkers Fight Back” campaign for the presidency of the union. 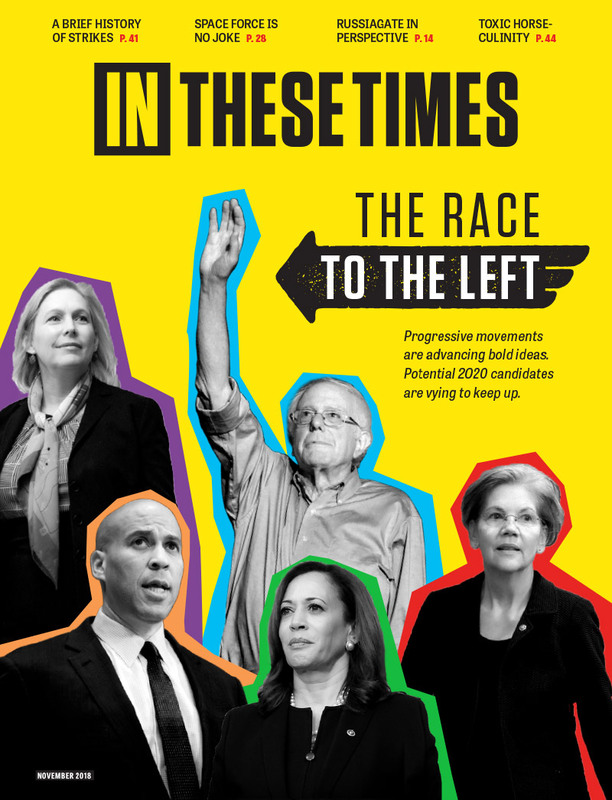 Building a multiracial coalition of rank-and-file workers, the campaign fused the spirit of the labor upsurges of the 1930s with the New Left politics of the 1960s and 1970s. Sadlowski crisscrossed the country campaigning at USW locals throughout 1976, speaking to packed union halls and appearing on national television, even debating his opponent, Lloyd McBride, on NBC’s Meet the Press. When the election was held in February 1977, Sadlowski got an impressive 44 percent of the vote, but not enough to win. He lost union locals in the South and Canada, where “Fight Back” did not have election observers. Though fraud was suspected, it was never proven. Despite the defeat, Sadlowski’s movement ultimately pushed the United Steelworkers to become a more democratic union, allowing members the right to vote on important decisions like the approval of contracts and whether to raise dues. He also continued to be a vocal supporter of union democracy and an inspiration to working-class activists, earning a spot in the Illinois Labor History Society’s Union Hall of Honor in 2012. “Ed said what few in power had the decency to admit: that ordinary workers have intelligence and creativity and grace, and deserve the rights and working conditions that allow us to live with dignity and possibility,” Chicago Teachers Union (CTU) Vice President Jesse Sharkey said in a statement this week. Among those Sadlowski inspired were his own children. His daughter, Susan Sadlowski Garza—a former activist in the CTU—was elected as Chicago’s 10th Ward Alderman in 2015 and was a delegate for Bernie Sanders in 2016. His son, Edward A. Sadlowski, is a longtime union organizer currently serving as Deputy Executive Director of the Milwaukee Teachers’ Education Association. contribution rates for current workers (and their yellow dog unions go along with it!). Great article! This country is headed to hell in a hand basket because of the demise of democratic grass root unionism; the rise of a nanny-state with labour laws that really serve business and replace activism with "the government" instead of collective bargaining; and the contempt with which big business and state and federal courts have abrogated labor contracts, and the contract clause of the constitution, with pro-1%-er judges and the bankruptcy courts! In Colorado cowboy country, the conservatives and rich (a strange collection of oil and beer peddlers, agri-biz farmers & ranchers, religious fundamentalists, crooked lawyer-lobbyist lead politicians of all parties, media monopolies, and the usual suspects like delusional self made millionaires with "American" in their companies' names, but who import everything from China, etc. you get the idea) have conspired under a California Prop-13 type tax limitation act (TABOR) to strangle government like a baby in a bathtub ... and this is sad because one of the few growing unionized sectors of the work force HAD (past tense) been in the public sector. Unfortunately the Democrats in Colorado feel justified in having been "forced" to raid state pension funds in order to circumvent TABOR. And the aforementioned "strange TABOR coalition" is only too happy to accommodate the larceny that eliminates COLAs, reduces benefits, and increases contributions for public sector workers (and their yellow dog unions go along with that!). Finally the rank and file class room teachers are starting to wake up to how their "union" leadership has sold them out... with some luck the Republicans and so-called Democrats have over reached and the modern equivalent of The Coal Field Wars (a century ago) are about to explode (metaphorically?). We need more people like that today, even as one who was never part of the union himself. We need to begin to organize workers with Uber and other gig economy platforms, at least to the point that they have a voice and are not totally disrespected.